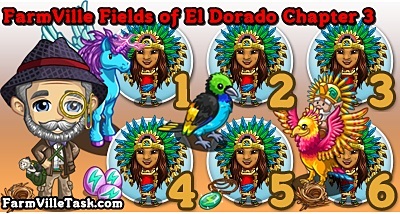 Help bring back more Legendary Birds in FarmVille The Stuff of Legends, a FarmVille Fields of El Dorado Chapter 3 Quests. We will helping the Duke to prove his dedication as required by Necti so that he can get close and pet some of the Legendary Birds of El Dorado. On this chapter of Fields of El Dorado Quests, we will need to master the crop jungle Blackberry to 1 star. In order to accomplish that we will need to harvest atleast 300 of it. We will also be making two Jungle Hideaway Recipe and two Herbal Hut Recipe. Note: Expected release date is on January 20. Monday. Info: Crafted for 10 min each at the Jungle Hideaway’s Bird Roost Oasis and it will need Exotic Feather x3. Info: Crafted at the Herbal Hut and it will need Jungle Blackberry Bushel x3, Chayote Bushel x3 and Avocado Squash Bushel x3. Info: Keep crafting Jungle Tonic to reach level 3 (crafting around around 6 times will do it). Info: To master the Jungle Blackberry to 1 star you’ll need to harvest atleast 300 of it. Info: Crafted for 10 min at the Jungle Hideaway’s Bird Roosts Oasis and will need Exotic Feather x2, Water Leaf x2. Info: Crafted at the Herbal Hut and it will need Maize Bushel x3, Bromeliad Bushel x3 and Wild Pinto Bean Bushel x3.